An now for something completely different as the boys use to say! The kinetic art and sculpture has some interest, for members of this forum. So finding this one even though it is about wooded ones was nice. It covers the basic mechanics of the movements. Then it has some simple projects. They can be also translated into metal too. So whether it is about weathercocks, wind toys, mobiles,jumping jacks. Or high up or garden moving art or the moving ball along rails as a member of our forum so lively displayed some of his past work. 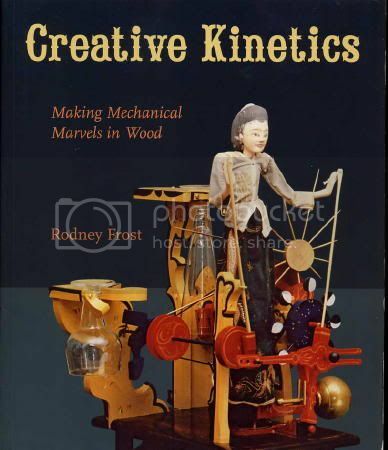 This book has something and covers a wide area of kinetics. Even though the motive force is a rolling ball along rails, it triggers an assortment other actions along the way. This book shows what devices,cams,cranks,shafts, belts and slots and slides. Can be made to do. Along with a number of projects for the reader to build or just a launching point for some ideas of your own. From small jewelry pieces to large installs.You are limited only by your imagination. Filled with color pictures and delightful primitive style drawings. You will filled this an interesting book even if only for the eye candy factor.